With an adorable plush teddy bear and delicious chocolate hearts, you’re sure to win over anyone’s heart! 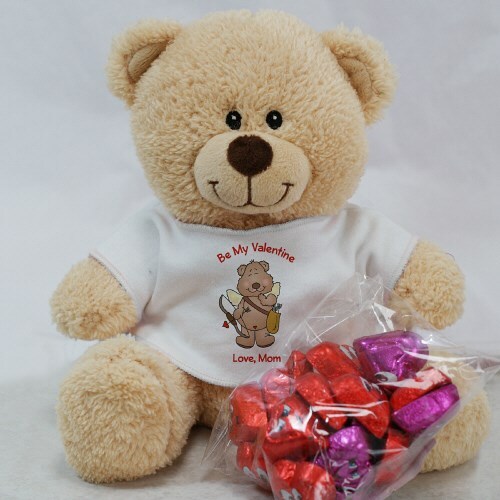 This romantic gift set includes one adorable 11” Sherman Teddy Bear and a package of our delicious, individually wrapped in Valentine colored foil, chocolate hearts. This Sherman Teddy Bear is exclusively from 800Bear.com! He has an irresistible look on his face along with a cuddly body and a wonderfully soft feel. He is wearing a t-shirt with our “Cupid” design and includes free personalization of any two line custom message. Free Gift Wrapping is included to create a thoughtful presentation. Additional Details Sherman is exclusively from 800Bear.com. He is a favorite teddy bear among many and always makes a wonderful gift idea. Shop our collection of Plush Valentine's Day Keepsakes to find the perfect, romantic gift idea.